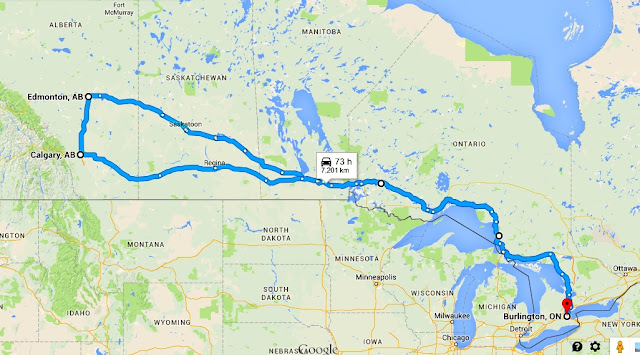 Adventures of a Starving Artist: Worship Wednesdays - Booking the Prairies Road Trip! Worship Wednesdays - Booking the Prairies Road Trip! Our first Prairies Road Trip! For the last five years, we've toured East, but for the first time, we're heading West. We'll leave Burlington, Ontario, in the final days of September. Throughout October, we'll sing concerts, lead worship, and teach workshops in Ontario, Manitoba, Saskatchewan, and Alberta. By the first weekend of November, we'll hit Edmonton, Alberta, for GMA Canada Week! We'll have 4 days of workshops, showcases, and other great events with our fellow GMA artists. From there, we'll drive home to Burlington with just enough time to take a little break before jumping into the Christmas season. To summarize: 6 weeks. 4 provinces. 7200 kilometres. Booking a tour of this size is always a challenge, but booking a tour this size when we've never sung in any of these areas is a particular challenge! We need a huge number of events to make this happen. My days are currently filled with reaching out to churches across our tour route, introducing our Infinitely More ministry, and asking the all-important question, "Would you like to host a concert?" - If you're in the any of these areas, or you know friends in the area, we'd love to sing for you! We'll be performing church, community, and house concerts. Please contact me for more information. - Please keep us in prayer that we'll book the number of events that we need. - Please feel free to share this post with anyone who might be interested! - Join our mailing list or follow us on Facebook and Twitter for the most recent news. Thank you! We're so excited about this new adventure, and this opportunity to share our music and message with a whole new audience. I'll keep you updated on how things shape up! Worship Wednesdays - Happy Canada Day!